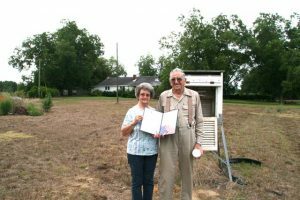 Mr. and Mrs. Olin Berry hold 35 year service award presented to Olin last Friday at the Berry residence in Johnston, south Carolina. Volunteers, through what is known as the Cooperative Observer Program, have served the nation for 125 years by recording and reporting weather data. Mr. Olin Berry, of Johnston, has been a part of the service for 35 of those years. That is why Kim Campbell, NWS Columbia Meteorologist-In-Charge was in the field next to Olin’s house last Friday morning. She came from Columbia to say thank you to one of some 10,000 volunteers nation-wide that record and send daily measurements of weather data to NWS. The data that Olin and his counterparts provide is used for climate and drought monitoring, water resource planning decisions and support to forecast operations. Ms. Campbell presented Olin with his 35-year service award just up from the okra patch in front of the national weather station. Olin took up the reporting May 1, 1980 following such notables as Mark Boatwright and Edmund Watson. He relates the history of his tenure starting with a comment made to a county agent that resulted in the weather station being put on his property in short order and includes the six to eight months that his wife, Miss Harriet, had to take over while he recovered from a motorcycle accident. The value of the information recorded and reported by Olin was described as “priceless for the climate record” by Doug Anderson, a National Weather Service hydrometerological technician also from Columbia. Numerous subscribers to The Edgefield Advertiser have commented that Mr. Berry’s weekly report is used as a source for maintaining their own weather data records. Willingness to allow at least one visit per year from a NWS representative. There is no doubt that Olin Berry has number 1 locked in.